If you are anything like me, you have folders upon folders of photos floating around on your computer. I have folders for each month and year on my desktop and other random folders that I just dump photos that I am too lazy to sort into. It is nice to know that they are all there somewhere, but it would be even nicer to actually have a physical copy of my favorites. Sure, I could get a bunch printed, but then what? I look through them when I get them, maybe plan to frame my favorites, forget about it after a few weeks, and then dump the pile into the current box in my closet that holds prints that I have done nothing with after I get sick of looking at said pile. To me, it doesn't really fix things. I think there is a secret to it though. And that secret is scrapbooking. No, not like grandma style scrapbooking, but modern cool chic hip (insert whatever fun adjective you want) scrapbooking. I don't know why I hadn't thought of it before. It seems so obvious to me now. I was first intrigued by and introduced to this idea when I read Elsie's Scrapbooking for Beginners post on A Beautiful Mess. It is like a light went on and all I could think is yes, this is what I need. I love the style in which she crafted her book. It is photo heavy, incorporates iPhone photos and DSLR photos well, has personal handwritten journaling notes, is colorful, and so aesthetically pleasing. I am just in love with it, seriously. 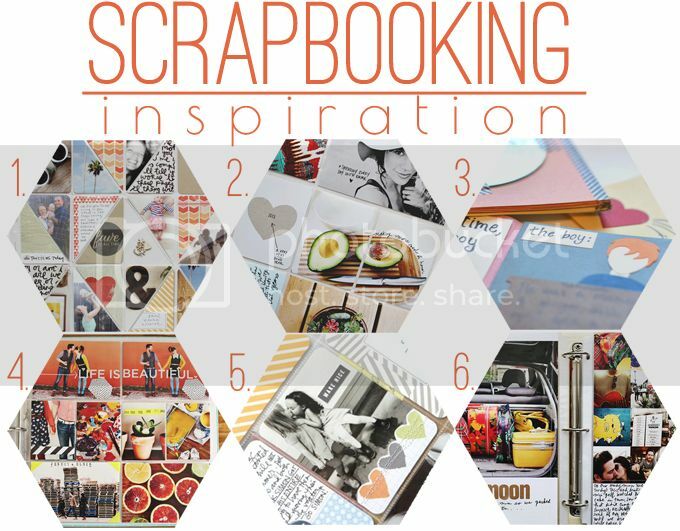 After pouring over her post, I clicked through to other posts about scrapbooking featured on ABM, and also found a couple other posts I enjoyed from other blogs. One of these is actually one of my sidebar buddies, Ella of Paper Umbrella! I think the book she made for her boyfriend is just darling. How do you feel about photos these days? Do you have a method you like already or are you considering something like modern scrapbooking? Hope all my American friends are enjoying a day off today! I haven't scrapbooked in SO long! I almost see my blog as a virtual scrapbook, but I know having something solid to hold in my hands is important, too! I need to start by printing some pictures! Oh my gosh, I have been putting off scrapbooking forever. My husband and our mom's want a wedding one, and now we've completed our first year of marriage so we need two volumes now! yay! Oh my gosh you are so right. I can already tell that it would take forever and I am hardly sure where I would start haha but I think it will be fun! That's a good point - blogs are like virtual scrapbooks! I hadn't really thought of that. At least I do have something before I can pull myself together to make a tangible book haha. Wow that's going to be a lot of work! I know, it's probably best to catch up now because it is just going to keep building up! I want to make one of my years with my boyfriend, but I don't know where to start or finish, since it has already been 2.5 years and I haven't made anything. sigh.